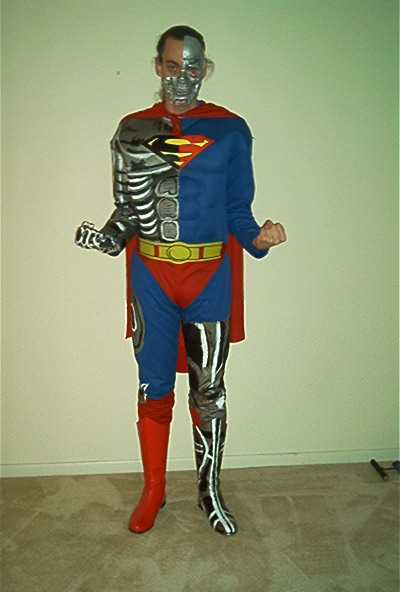 Weirdo Zone - View topic - My Cyborg Superman costume. It's not sold in any store. I made it myself. Do I pass? You have my vote! That's frekking radical! You built that all from scratch? Damn, thats some sweet tailoring. You swing a mean needle McGurk! My bad.. I should have worded it better.. What happened was, I bought a standard Superman costume, paying the additional five bucks for the enhanced muscle chest. Then I painted all the appropriate areas in rich silver, and added black and titanum white plus a little metallic white to it, so it would look more Cyborg-ish than Man of Steel-ish. I couldn't find a comics scene with the Man of Tomorrow's back without the cape, so that was up to my imagination. Half of the red "S" was filled in with a black permanent marker. The cape and belt I left as they are. The red superhero boots I ordered with the costume, painted much like the rest, and covered the red zipper with silver duct tape. The mask came with a do-it-yourself cyborg skull mask kit. I covered it with the silver make up, then added red and black later. Then I cut it to show part of my face. The liquid latex adhesive I didn't have the patience for, so I used scotch tape instead. And, I used a medium latex glove from Publix, panting it just like the rest. Ah, well... I still think it rocks! Not bad paint work to be sure. So you still get a thumbs up! You'd win our costume contest if we had one!